How appealing is this retro-styled premium compact? In the past few months, the majority of camera manufacturers have introduced a new premium compact camera to their ranges. It's a lucrative area of the market, appealing to those looking for a good back-up camera and those who can't get everything they want from the camera on their phones. 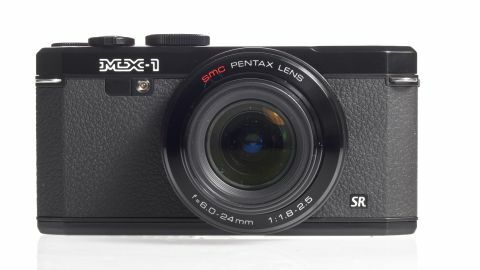 Pentax's latest introduction, the MX-1, is styled after the original film camera of the same name. It's a positively retro design, at least from the front. At the back is a tilting LCD screen, which belies its digital reality. According to Pentax, the camera's 12 million pixel back-illuminated CMOS sensor is a new design from Sony. The sensor size is typical for premium compact cameras (except the Sony RX100), coming in at 1/1.7 inches, which is the same as the Panasonic LX7, for example. A top sensitivity of ISO 12800 is available, with the company promising low noise and super high resolution images. A new imaging engine is also included to offer quick image processing for clear, high quality images with plenty of detail. The 4x optical zoom lens offers a maximum aperture of f/1.8 at its 35mm equivalent wide angle of 28mm. The maximum aperture rises to a still respectable f/2.5 at the telephoto end of the lens. The camera also features a 1cm macro mode for shooting images close-up. An intelligent zoom function is available to extend the zoom coverage up to approximately 7.8x times, or around 218mm in 35mm format. To go along with the retro design of the camera's exterior, the Pentax MX-1 features a textured rubber grip and brass top and bottom panels. Unusually, Pentax actually hopes that the paintwork will chip off from these areas to reveal the brass underneath, and giving it an aged, distressed feel. Other interesting features of the Pentax MX-1 include its ability to capture photos in raw DNG format, rather than a proprietary format favoured by most of the other brands. It also boats a dual-shake reduction system to help prevent blur in images, and Full HD video recording. The Pentax MX-1 measures a surprisingly substantial 60 x 123 x 52mm (2.4 x 4.8 x 2 inches) and weighs 391g (13.8oz) loaded and ready to shoot. Priced at £399/$499.95, it's certainly not a cheap option, but it does put it in contention with many of the other premium compact cameras currently on the market, including the Sony RX100, Panasonic LX7, Canon S110 and Olympus XZ-2.